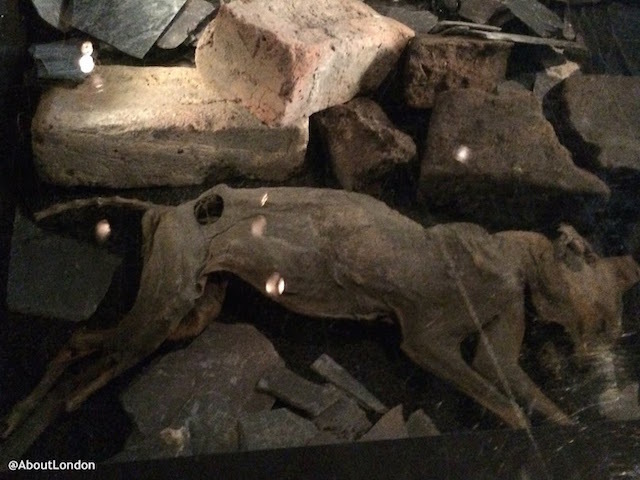 If you haven't seen it, The Museum of London cat is in the Expanding City: 1666-1850s gallery. It is set into the floor with other things found during excavations undertaken to expand the museum. So alongside tea cups, toothbrushes and clay pipes is a long-dead moggie with its jaw hanging off. The reason it's been kept is to remind us it was once thought to be good luck to brick up a cat into a building during construction. You may well also see similar feline remains in National Trust properties. In the basement kitchen of the Charles Dickens Museum you'll find Bill Spikes, the museum's resident hedgehog. Why? Because hedgehogs were sometimes kept in Victorian kitchens to eat the insects. Look up in the Bank of England Museum's Stock Office (the first room you enter after security screening) and you'll spot a stuffed cat laying on the beams and looking rather startled. 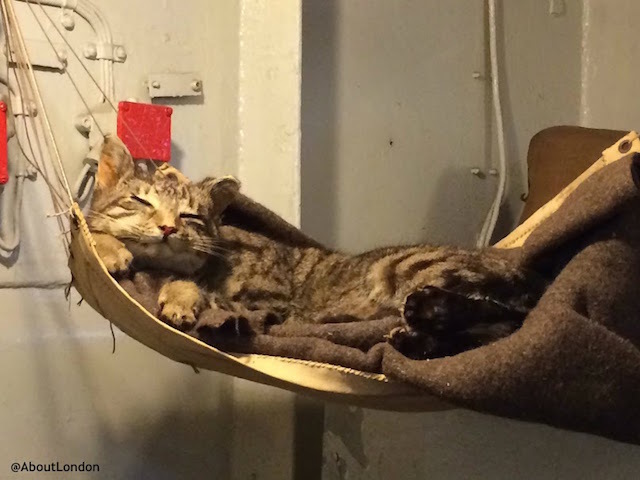 Amongst the slightly freakish mannequins lounging in hammocks on HMS Belfast you can see a contented cat in its own hammock. There's another more animated stuffed cat in the food stores to catch the rodents. Probably Britain's most famous nurse Florence Nightingale had a pet owl called Athena. The bird is on display at the Florence Nightingale Museum with some other dead animal oddities. Edith Cavell's dog Jack is currently on loan from the Imperial War Museum, and they also have Jimmy, a pet tortoise who lived in the wards of Scutari Barracks in the Crimean war. 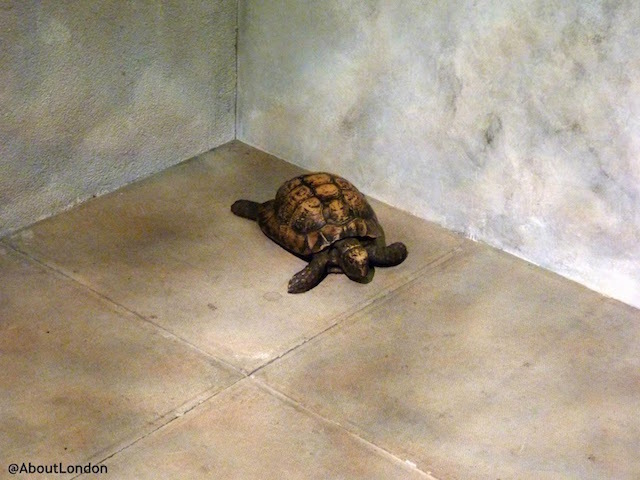 Speaking of tortoises, there's a family pet tortoise on display in the New Port New City 1945-Present gallery at the Museum of London Docklands that belonged to a family who moved into one of the new housing developments in Poplar. At the MCC Museum at Lord's Cricket Ground there is a dead sparrow mounted on the ball that killed it. The ornithological tragedy occurred at Lord's on 3 July 1936 during a game between Marylebone Cricket Club and Cambridge University, when Indian cricketer Jahangir Khan unleashed a wicked bowl which struck the unfortunate bird mid-flight. It would have been more apt if it had been a duck. While many of us know about Get Stuffed, the taxidermy specialists on Essex Road, (they have a giraffe in there!) 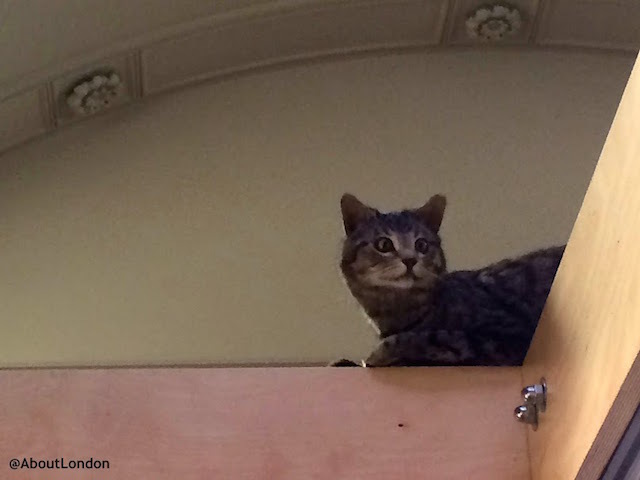 have you spotted Binks the cat at Bates on Jermyn Street? For many decades he has sported a black silk top hat and a fine cigar. Quite the star now, Binks even has his own twitter account. Ye Olde Cheshire Cheese has preserved Polly the Parrot, who lived at the pub in the 1920s. The feathered mascot was capable of swearing in many languages and was loved by all. OK, it's not a pub, but The King's Head private members club on Kingsland Road has some incredible taxidermy including a tiger leaping over the bar, a polar bear in the corner and two zebras over the fireplace. The Hunter S in De Beauvoir Town has plenty of cut-off animal heads (exotic and domestic) mounted on the walls too. Dirty Dicks on Bishopsgate has a bizarre collection including a dried puffer fish, a damaged stag's head and some unidentifiable bones. Further into The City, Seven Stars on Carey Street has replaced the famous ruff-wearing feline Tom Paine with a new very-much-alive black cat, but it also has on display various animal skulls in the window. Brewdog Shoreditch had an expensive beer that was sold inside dead stuffed animals (a stuffed stoat or grey squirrel) and there's still a squirrel in the window with a bottle protruding from its mouth. The Zetter Townhouse in Clerkenwell has Skippy the kangaroo wearing boxing gloves, and a nameless companion: a stuffed ginger cat in a dress. In Tooting there's a good pub called The Antelope. It doesn't have a stuffed antelope, alas, but it has two stuffed foxes behind the bar. Restaurant Story has some taxidermy, as does The Elk in the Woods, the quirky Scandinavian restaurant in Camden Passage, and The Horatia pub in Islington too. 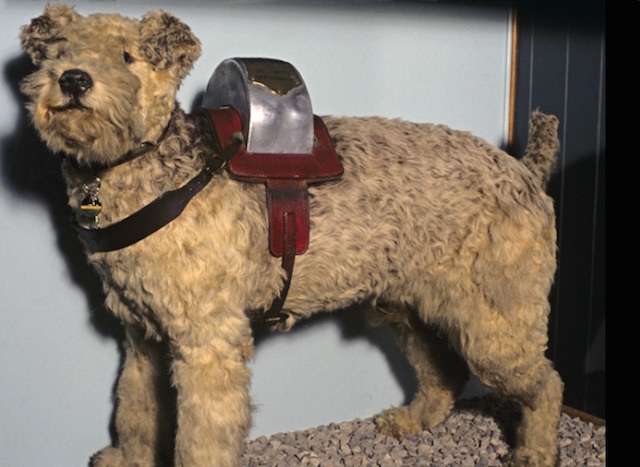 "Laddie" was an Airedale Terrier who worked collecting for charity at Waterloo station in the 1950s to raise funds for a retired railway workers' home in Woking, Surrey. When he died in 1960 he was stuffed and put on display in a glass cabinet at Wimbledon station where he remained until 1990. He now resides at the National Railway Museum in York.